This is an on-loom workshop taking fiber in a new direction by creating “crimp cloth.” Learn to create fabric with permanently crimped designs that hold their memory even when washed. Apply this stash-busting technique to any threading and learn the thought process that will lead to endless possibilities for creating magic cloth. Participants will draft, weave, and crimp their samples in class. Learn how the fabric can be used for one-size-fits-all garments that flatter any figure, scarves and shawls that won’t slide off your shoulders, and knit-look ribbing for a sweater or jacket collar. Garment design and sewing tips are included. Advanced beginner and beyond. The two-day workshop is a condensed version of the original workshop. Students will learn the techniques to create crimp cloth. No dyeing involved. Advanced beginner and beyond. Through lecture, computer software (Fiberworks PCW), and drafting exercises, learn the basics of designing with twill. The twill circle, twill ratios, and fancy twill is included, with emphasis on figuring out tie-ups, threading and treadling options. Bring a loom with the warp beamed but not threaded. A twill sampler will be woven in class. Learn to “read” your pattern as you weave to eliminate the slow process of following a treadling order on paper. Using your new knowledge, design an original draft ready to use at home for your next project. A laptop with software downloaded, helpful, but optional. Learn to create permanently crimped fabric with a ‘non-dye’ variation of woven shibori. Use the “crimp cloth” for clothing and accessories that flatters any figure. Although the crimping process is the same for warp or weft shibori, designing, drafting, weaving, and using the finished fabric varies between the two methods. An in-depth study of both methods will be included in the lectures and visual presentations. Be inspired by the endless possibilities. Sewing tips for using this amazing cloth will be included. Advanced beginner and beyond. Discover “crimp cloth” to add to your weaving repertoire. Using a ‘non-dye’ variation of woven shibori, learn to create fabric with permanently crimped designs that hold their memory even when washed. An overview of both warp and weft shibori will be presented through lecture and visual presentation. 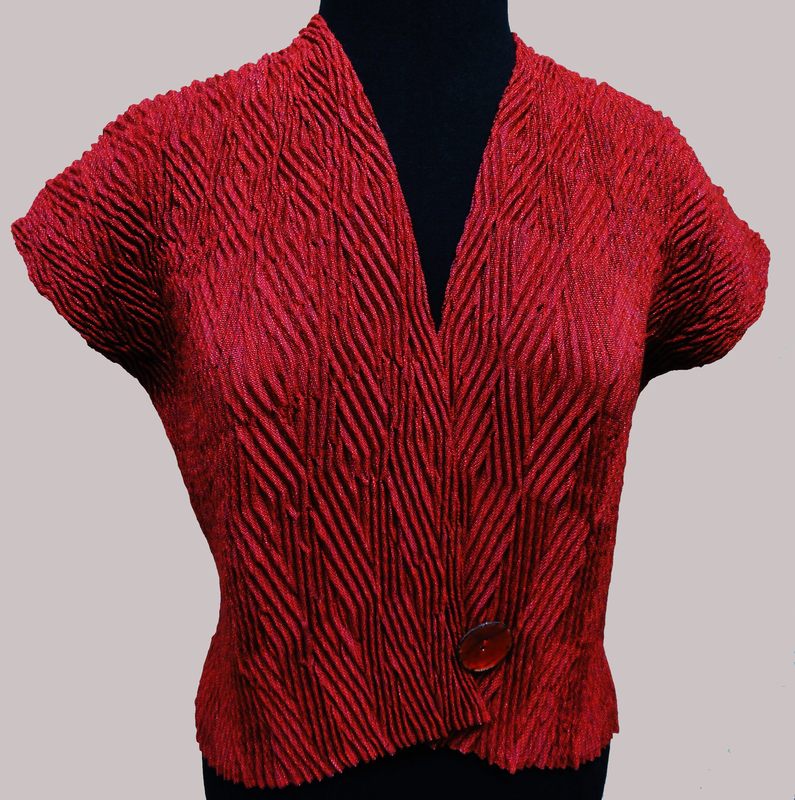 See how the fabric can be used for entire garments as well as for permanent pleating to replace knitted ribbing for a sweater or to add a knit look to the collar area of a jacket. Be inspired with the ways to use this amazing cloth. Advanced beginner and beyond. Bags, purses, and totes – create a carrying vessel of any shape or size. You may already have fabric in your stash, handwoven or not, that is suitable for a bag. If not, weave sturdy fabric using yarn or rags. From elegant to simple and functional, choose from patterns provided, have fun creating your own unique project, or bring a commercial pattern. Using a PowerPoint presentation, you will be guided in every step of the planning and construction of your chosen bag. We will begin by focusing on planning and creativity, then work toward completing your project. The ability to use a sewing machine is necessary. To view a current schedule, please click here. Dianne’s extensive exploration of a variation of handwoven shibori has opened up a whole new weaving world of possibilities. She calls the resulting fabric crimp cloth. Through visual presentation, view the garments that flatter your figure, the shawls that won’t slide off your shoulders, and scarves that can serve a dual purpose. This is a technique that will inspire you to jump into your “stash” and start creating fun fabric. Through a PowerPoint presentation, Dianne shares her approach to designing and sewing one-of-a-kind garments and what she learned along the way. See what steps she takes to make her ‘visions’ materialize. Also included will be her work with the Fabric Forecast Team of Handwoven magazine. It concludes with her current work – ‘crimp’ clothing and what led her to it. Hi, Dianne: I took your workshop with the Woodland Weavers in Grand Rapids MI and experimented with polyester thread along with the orlon, and then using disperse dyes to print on the warp before pulling the threads. would love to send them to you. Hi. I was wondering if you have any plans to offer these classes (crimp cloth) in video format? It would be wonderful for all of us who aren’t able to get to seminars! I have two DVD’s available through Interweave Press: “Woven Shibori, Making Crimp Cloth” and “Woven Shibori, Sewing with Crimp Cloth”.